Sea-Eagles - 'How to Age the Chicks'. 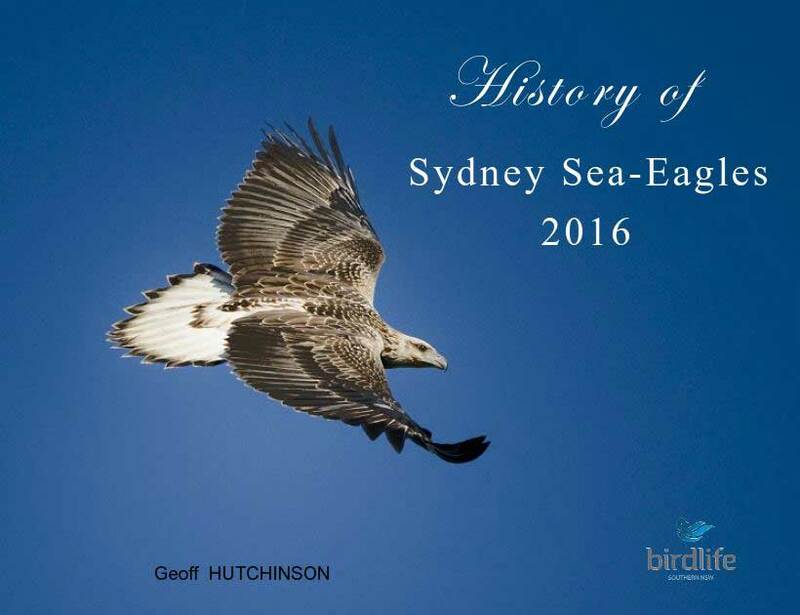 Please note that this information developed in 2011 & was based on the available literature and the observations from Sydney Olympic Park nest in 2010. It was derived from 24 hour High Definition Video surveillance from a reasonably close distance. This data will be updated from time to time as it comes available. 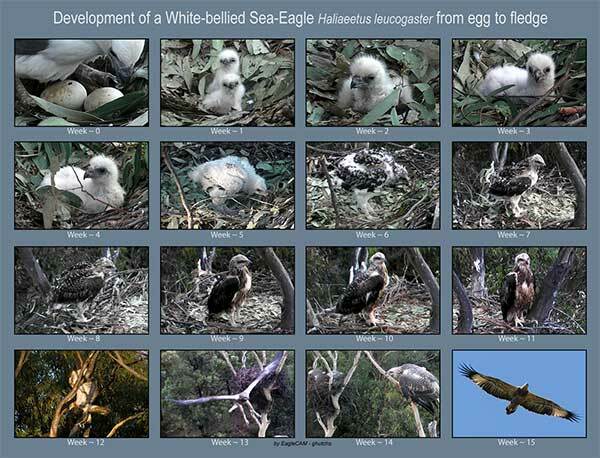 The seaglets may develop more quickly or slowly; many factors can influence developmental progress. Estimating the age of an Eaglet on the nest in the Field. Week 00: The eggs hatch between 39 and 41 days after laying. The second egg may have been laid upto two to three days after the first egg. 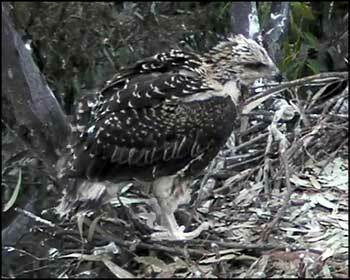 The incubation may have been deliberately delayed till the second egg is laid. 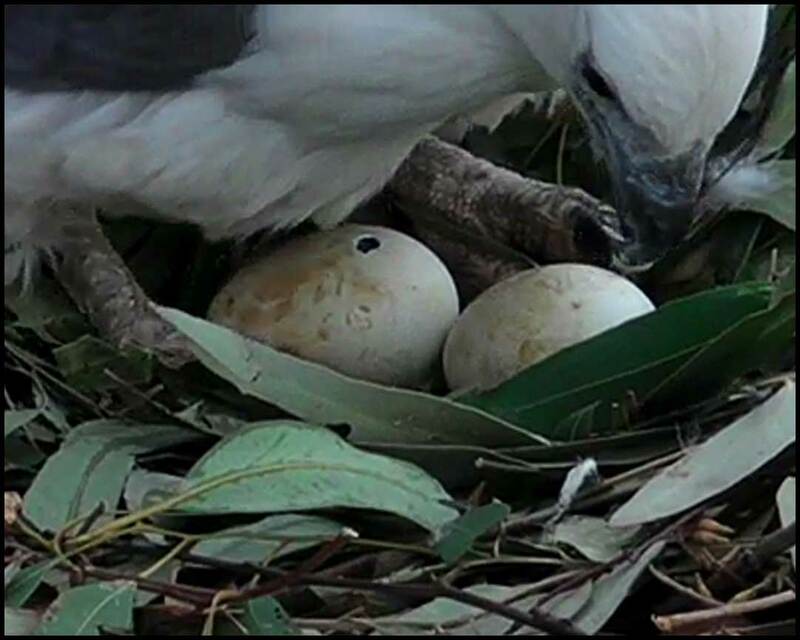 Because of the time of day the eggs were laid, to calculate the amount of incubating days from lay to hatch is difficult because the eggs may take 12 hours to hatch. So predicting the exact amount of days to hatch is a guess at best. The best guide is 40 days. Week 1: Chicks are covered with a fuzzy looking white natal down. They are sitting upright by the end of the week and being fed by the adults. Some sibling rivalry has already started. Week 2: Chicks covered with white fluffy down, the beak (bill) has started to grow longer with the little white spot on the end still visible, (possibly the remains of the egg tooth). They have started to venture out of the nest bowl although still crawling (not standing).At day 7 to 9 they have started to squirt poo over the side of the nest. Week 3: The chicks are covered in white down, the bill and eyes have greatly enlarged. The chick has doubled in size from when it hatched. 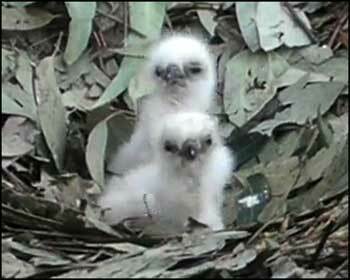 They are pecking at leaves and venturing out of the nest bowl more. They are looking around and looking at things outside of the nest. Week 4: Chicks covered in white fluffy down with some pin feathers starting to show on the wings. Starting to preen their new pin feathers. Starting to stand resting on their tarsus being assisted by their wings to maintain balance. 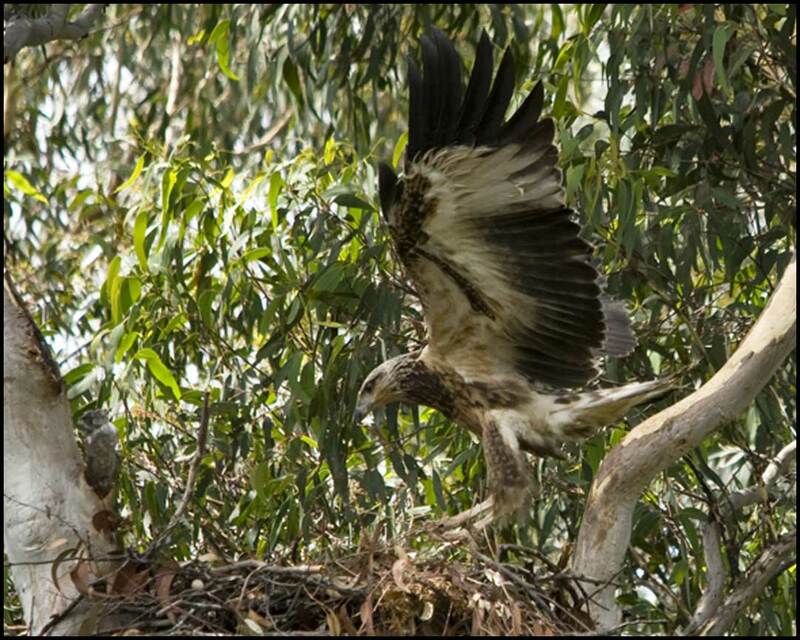 Moving around the nest and looking out away from the nest. 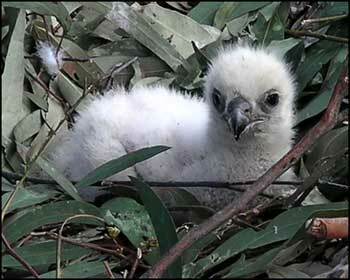 Picking up sticks and leaves in the nest. 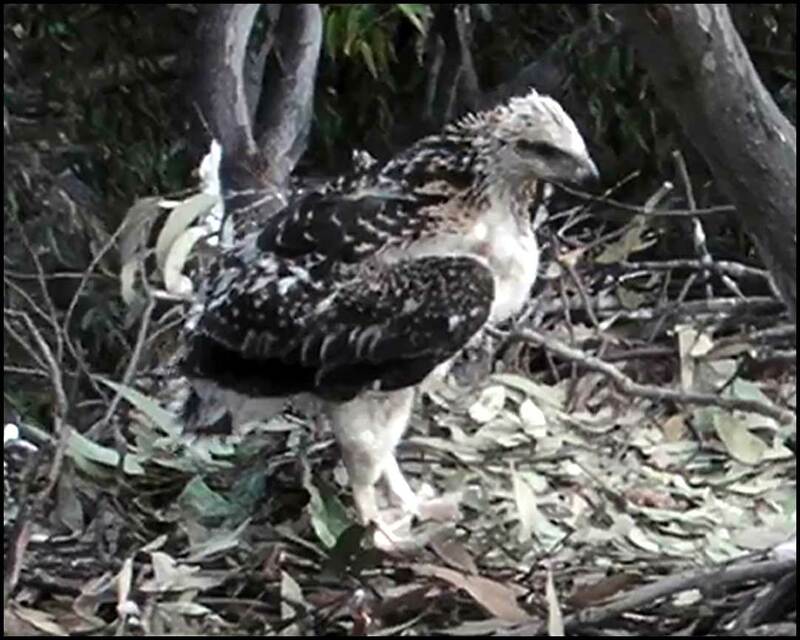 Week 5: The chicks are still covered with white down but feathers are appearing on the shoulders and back, they are also lengthening on the wings. They are occasionally standing on both feet, not resting on their tarsus. They are actively pecking at twigs and leaves, and picking up food in an attempt to self-feed. Starting to wing flap. Week 6: Week 5 to 6 is the biggest change from fluffy chick to Eaglet. 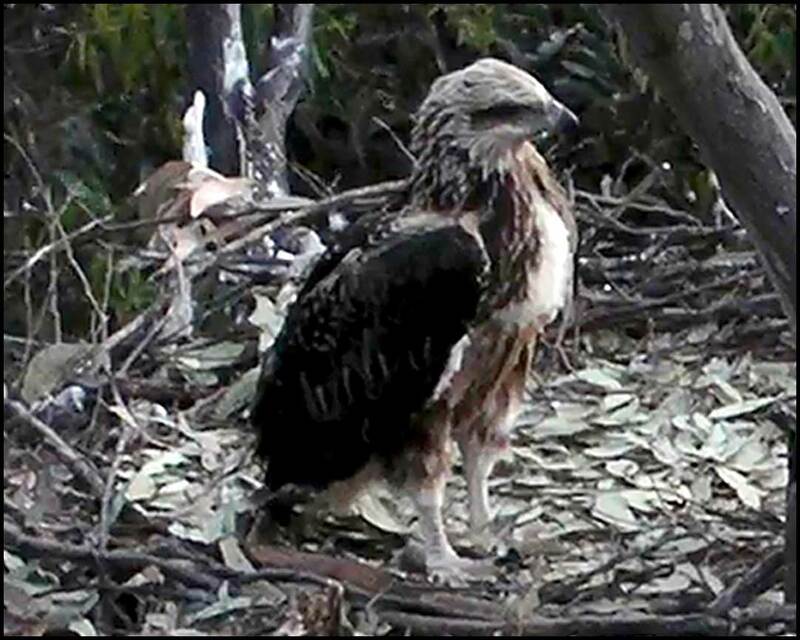 Head and chest are still showing signs of some fluffy down but more dark feathers are starting to show all over. They are very actively preening. 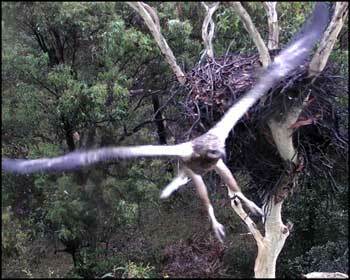 They are doing lots of wing flapping and stretching. They are able to stand on the two feet without the aid of the wings although very leant forward. They are making some effort to self-feed. Week 7: White fluffy feathers still on head, chest and legs. 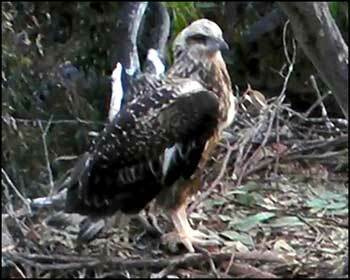 Dark brown feathers on back wings and developing on tail. Lots of preening. While sitting wings are spread sometimes. Sometimes mantling, lots of wings flapping and spreading. Standing a little more upright but still leaning forward and a bit shaky, standing near edge of nest and defecate over the edge. Grasping twigs and food with feet and some self-feeding. Week 8: Body and wings mostly covered with dark brown feathers including head and chest. Sitting with wings drooping (getting heavy). Hopping and flapping wings. 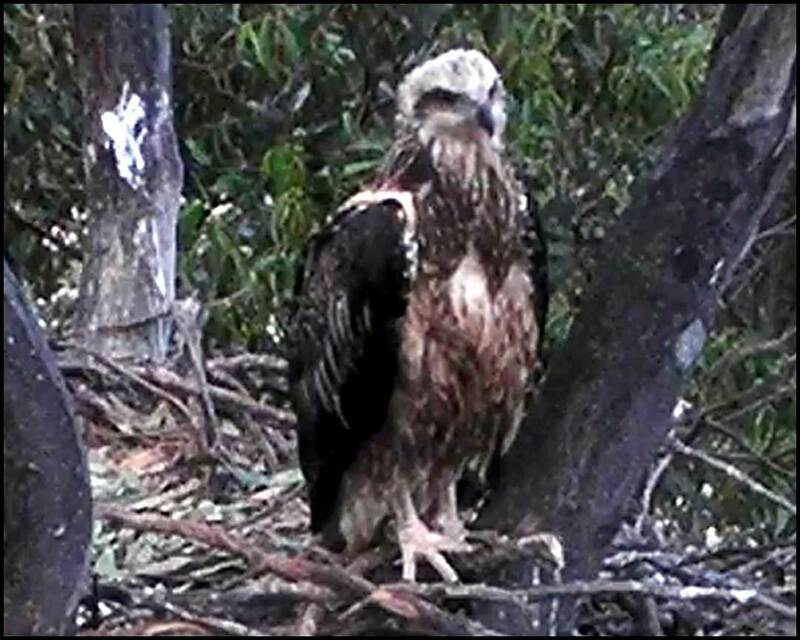 Holding food and tearing bits off, wings spread over food (mantling). Actively watching things overhead. Standing on feet for longer periods but still stooped forward. Week 9: Feathers developing more definition over the whole body and wings. Standing for longer periods almost fully upright, sometimes on one leg. Hopping and flapping wings. Self-feeding with some mantling. 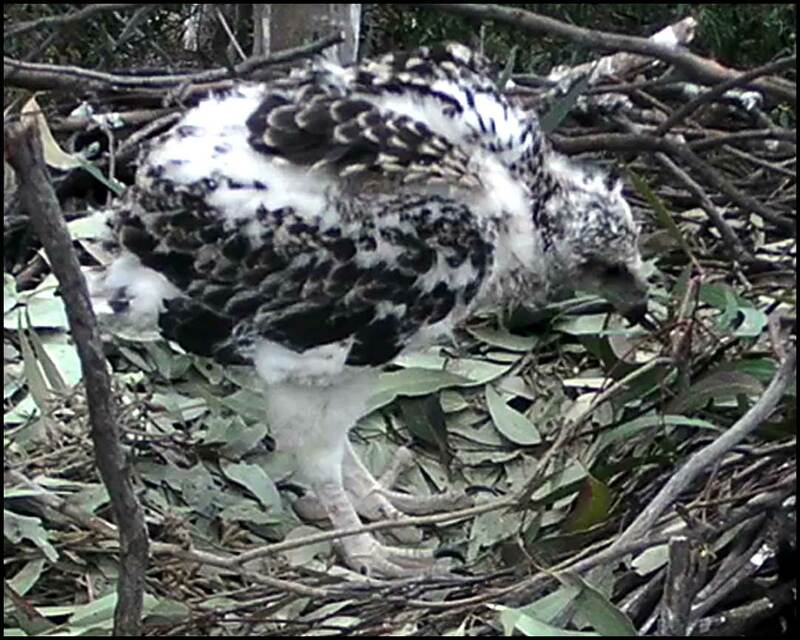 Sleeping standing upright with head tucked under wing. Week 10: Mostly fully feathered but still developing with downy under wings. 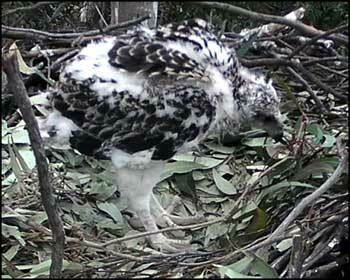 Vigorous wing flapping and hopping, standing on one leg for extended periods. Mostly self-feeding but still some feeding by the Adults mainly the female. Week 11: Feathers almost fully formed over the whole body and wings. Tail still short. Doing much wing exercise with some hovering gaining good height. 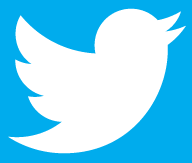 Perching on the edge of the nest for long periods. Sleep with head tucked under wing. Self-feeding. Starting to branch (flapping and jumping on to close branches). 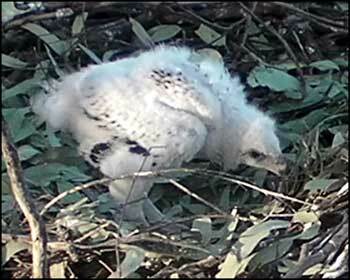 Week 12: Feathers almost fully developed. Lots of wing exercise and persistent branching. 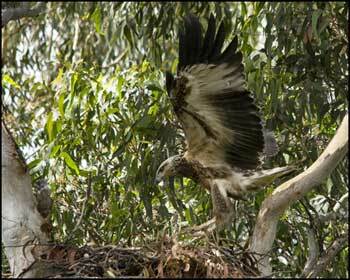 Mantling over food when delivered to the nest, self-feeding. 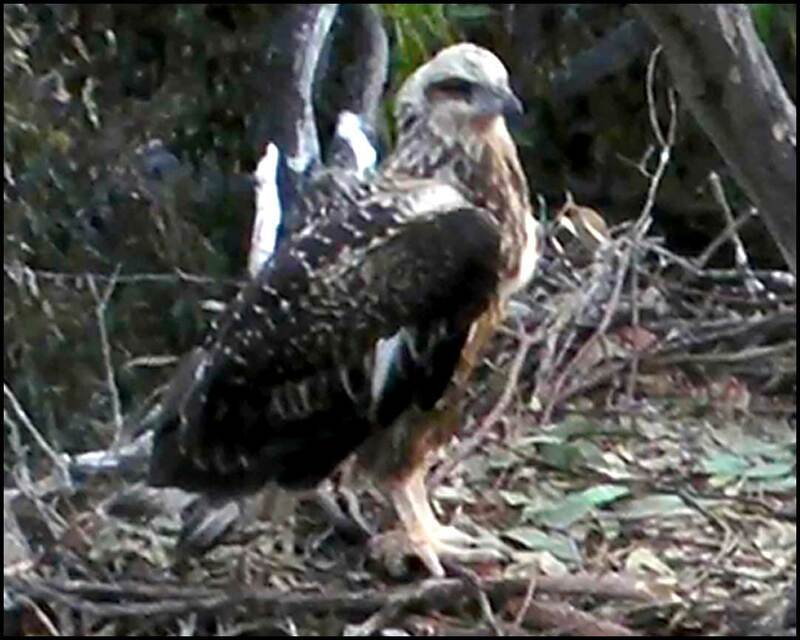 But still occasional feeding by Adult. Sleeping on branch adjacent to the nest. Week 13: Feathers fully developed self-feeding. From now they may take their first flight. They may not come back to the nest form fledge. 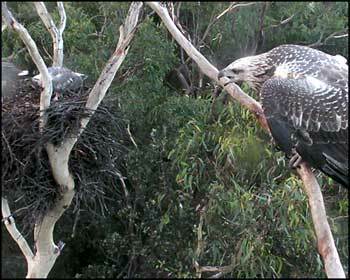 They may be roosting in trees close to the nest and may be fed by the adults ( Female). 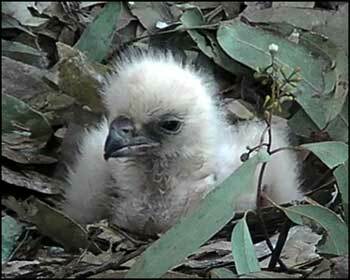 Week 14: Eaglets may still be on the nest, not fledged. 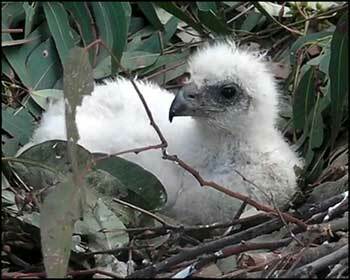 Eaglets that have fledged may return to the nest to be fed by the adults.